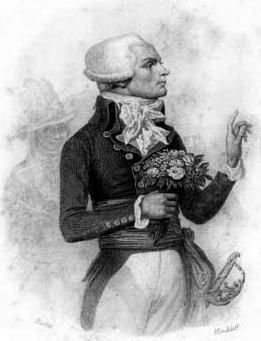 Maximilien de Robespierre (1758-1794) was the head of the Committee of Public Safety in France at the time of the French Revolution, leader of the Jacobins and sent to the guillotine numerous alleged enemies including King Louis XVI and Queen Marie Antoinette. Then Robespierre met the same fate himself: he was guillotined in 1794 after he gave a speech warning against the what he perceived to be government excesses and human rights violations. Robespierre's death ended the Reign of Terror. Robespierre was born in Arras in 1758. At the age of five his mother died in childbirth and shortly afterwards, his Father ran away leaving the children to be brought up by their Grandparents. He excelled at school and was chosen to recite a Latin address to King Louis XVI upon the King's visit to Arras. As a student training to be a lawyer, he became an advocate of Jean Jacques Rousseau. He worked ferociously hard as a lawyer. He was meticulous in dress, always wearing a cravat and a spare in case the first should become creased. He was teetotal and there is no record of him having a boyfriend or girlfriend. Contemporary accounts suggest he was a driven and single minded man. In 1780 in a supplement to Encyclopedia, written by Benjamin Franklin, studying the nature of electricity prompted a resident of St Omer to install a lightning conductor on his roof. Fearing the consequences, his neighbours took him to court to have the rod taken down. Robespierre was successful and he won renown throughout France. In 1781, Robespierre was elected to the bar and in 1786 he was elected as President of the Arras Academy, and he befriended peasants in the area, and produced pamphlets detailing the squalor of their lives. From a drawing attributed to Gerard, ca. 1900. Following the revolution of 1789, Robespierre gained high rank in the French legislature and began work on the freedom of the press and the emancipation of Protestants and Jews. In 1791 the King attempted to flee from Paris and France, in order to raise a foreign army to invade France and restore the previous Absolute Monarchy. The King was caught, and his actions led to disbelief amongst many of his supporters. This led Robespierre, who had never previously done so, to question the monarchy. He declared "ni monarchiste ni républicain" ("neither monarchist nor republican"). This position of no longer supporting the King, but stopping short of supporting a Republic was not unusual at the time. It was Robespierre who called the loudest for the execution of King Louis XVI after the King's arrest on the 10th of August 1792. As the head of the Jacobin Club, Robespierre orchestrated the downfall of his political opponents the Girondins, and became the absolute leader of the French Revolutionary Government and the Terror. He also ordered for the closing of various churches, even going as far to occasionally raze the church steeples to the ground, citing that their design invoked the aristocracy and thus were "undemocratic." After declaring himself the head of the Cult of the Supreme Being (a deistic religion opposed to the Catholic Church) he was overthrown and executed during the Coup of Thermidor. Robespierre was later made into a monument at the Alexander Garden following the October Revolution by the Bolsheviks, who were inspired by the French Revolution. However, the monument was poorly made (being made of concrete and pipes instead of marble or bronze due to the events of the Russian Civil War and lacking resources for either) and eventually collapsed on November 3, 1918, three days after being unveiled. He was part of a line of statues, the Monumental Propaganda, commemorating various other French Revolutionary figures such as Georges Danton, François-Noël Babeuf and Jean-Paul Marat, although the only one besides Robespierre himself to be completed was the one featuring Danton. Another Robespierre monument was raised in Petrograd. This page was last modified on 28 January 2019, at 10:16. This page has been accessed 26,478 times.